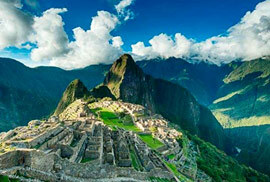 You want to visit Machu Picchu, don’t really like trekking but want to see as much as possible? This tour will take you to Machu Picchu within one day by car, passing the Sacred Valley of the Incas, a vantage point at 4,300m / 14,100ft., driving trough different micro-climates such as high mountains and jungle and including a visit to the hot spring waters of Aguas Calientes. We start our bus ride in Cusco, with a nice, scenic ride to the Sacred Valley of the Incas with beautiful mountains surrounding us. After a short break in the town Ollantaytambo we will drive a long, winding mountain path to the “Abra Malaga” at an altitude of 4,300m / 14,100ft where you can enjoy a panoramic view on some of the most amazing landscapes Peru has to offer. 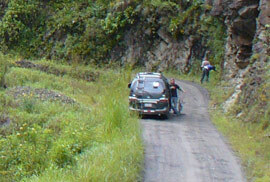 We continue the ride descending to the thick jungle, passing through the different micro-climates. Driving on unpaved roads and passing Santa Maria where we take a moment to rest, we continue on to the small town Santa Teresa, where we’ll have a delicious lunch. Then the last part of the journey begins: we will return to the route in the direction of the train station at the nearby Hydroelectric Plant. There the route ends and you have 2 options to get to Aguas Calientes, the city next to Machu Picchu: you can either take a train or walk for approx. 2.5 hours along the railways and have some exercise after the long time of sitting in the car. In Aguas Calientes you’ll check into your hostel, enjoy a nice dinner and can take a relaxing dip in the natural hot spring waters. Early in the morning you can either walk or take a bus up to the citadel of Machu Picchu. You will be given a guided tour for around 2 hours, including sites like the Intiwatana (Temple of the Sun), the Temple of the Condor, the Temple of the Three Windows, Andean terraces and other interesting places. Then you will have some free time for your own explorations. Walk through narrow paths and impressive stone walls, capture these incredible moments on your camera and feel and enjoy the special atmosphere of this sacred place. At around 1pm, you take the train back from Aguas Calientes to the hydroelectric plant where your driver waits with the car. We drive to Santa Teresa where we will have a break for one last chance to get some food or use the restroom before we start our drive back to Cusco, returning down the same road like the day before, and arrive in Cusco at night. End of the service.